as if through a red regiment. about breaking the Lord’s lock. 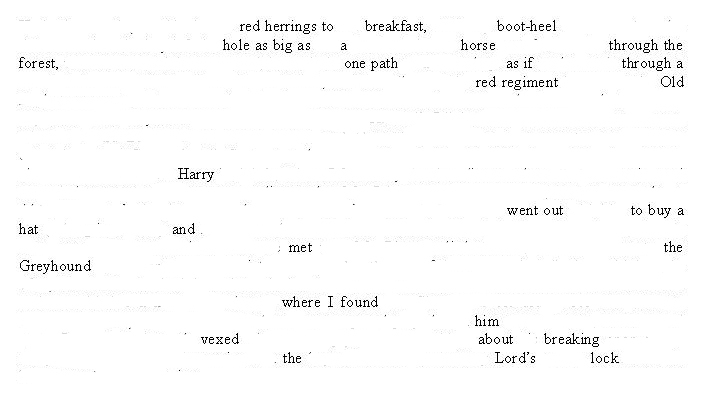 Erasure poem derived from The Diary of Samuel Pepys, Tuesday 28 February 1659/60. a beast from an angel, a beast from a man? yawning open; the terrible thunder of hooves. Pity and penance too late— And sleep? emissary of that fourth dark rider. In response to Via Negativa: Four Horsemen. and over the chimney a bird, an iron owl. and kissed a plain bold maid. 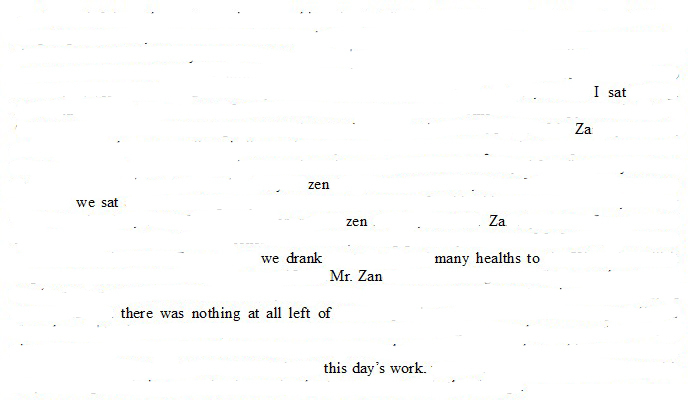 Erasure poem derived from The Diary of Samuel Pepys, Monday 27 February 1659/60. neon signs indifferently flash the name of this stop. high on the hind leg of the animal where he cannot reach. harbor, hospice, heaven. Is this foolishness? The ticket is returned; the traveler may pass. In response to thus: small stone (220) and Via Negativa: Mr. P.'s Poetry. stand in church till dark. Then wine, two bottles; a rose and no wit. Let my pitiful verses get a laugh. My folly has friends, I note. 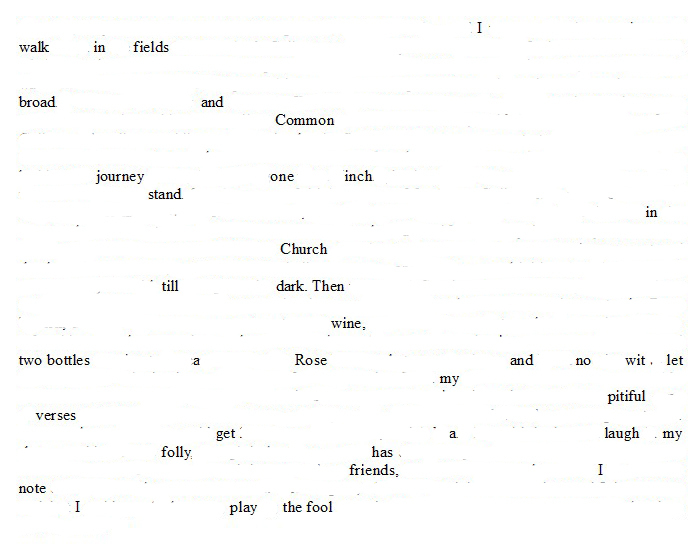 Erasure poem derived from The Diary of Samuel Pepys, Sunday 26 February 1659/60. going through the rusted pipes. we gathered at least two extra drums. the warm house of our mouths. In response to Via Negativa: Blankets and small stone (219). one speaks, the other listens. 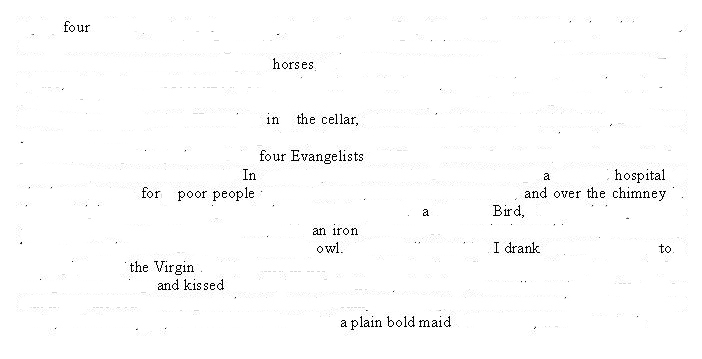 Erasure poem derived from The Diary of Samuel Pepys, Saturday 25 February 1659/60. & one is the color of your eyes. exiled from the blue of your eyes. In response to Via Negativa: Easy Rider.